I must confess that as much as I love to entertain I am terrible with planning ahead of time. I am one of those fools that is always running around the kitchen during a dinner party trying to figure out how I am going to finish cooking the lasagna and still manage to get dessert in the oven. I have really been trying to make an effort to get more organized and use dishes that can be prepped ahead of time. Last week I had to cook for a group of twenty and I knew that I would be crying in the guacamole if I didn’t’t do some prep ahead of time. I love serving this salad to a large group of people. 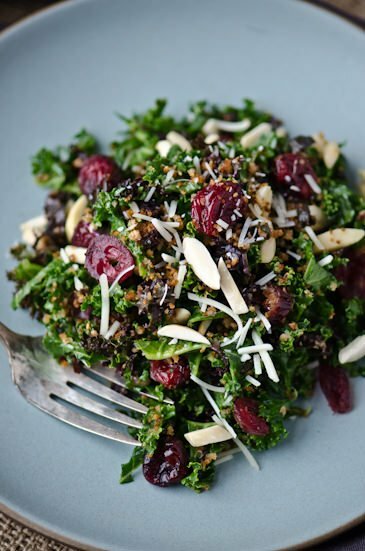 Since kale actually benefits from sitting for awhile after you dress it, you can get all of the components ready well before you need to serve it and add the nuts and breadcrumbs at the last minute right before thou serve it. It’s easy to put together and the addition of the bread crumbs makes it unique enough to stand out from have your guests asking for the recipe. 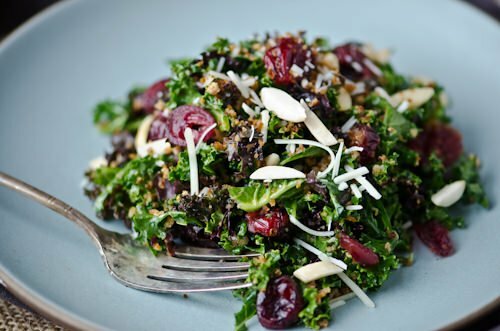 Remove the tough inner ribs on the kale, slice into ribbons and place in a large bowl. In a food processor or blender tear the bread into small pieces and process until fine crumbs form. Heat the teaspoon of olive oil over medium heat, add the breadcrumbs and cook for 3-5 minutes until the breadcrumbs are toasted and start to brown. Set aside to cool. In a small bowl, grate the garlic using a micro plane grater. Alternatively you can smash the garlic with the back of a knife, add a sprinkle of salt and crush the garlic until a smooth paste forms. Add the vinegar and lemon juice to the garlic and then slowly whisk in the olive oil. Season with salt and pepper to taste. 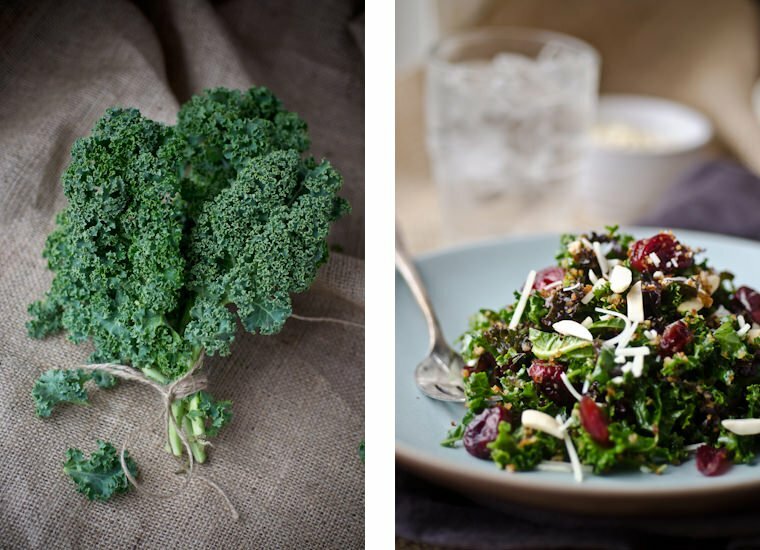 To dress the salad, pour the dressing over the kale and using your fingers work the dressing into the leaves making sure that everything is well coated. 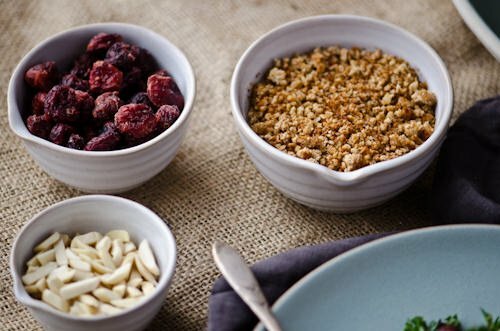 Add the cranberries, Parmesan, almonds and ¾ of the breadcrumbs to the mixture and toss to combine. 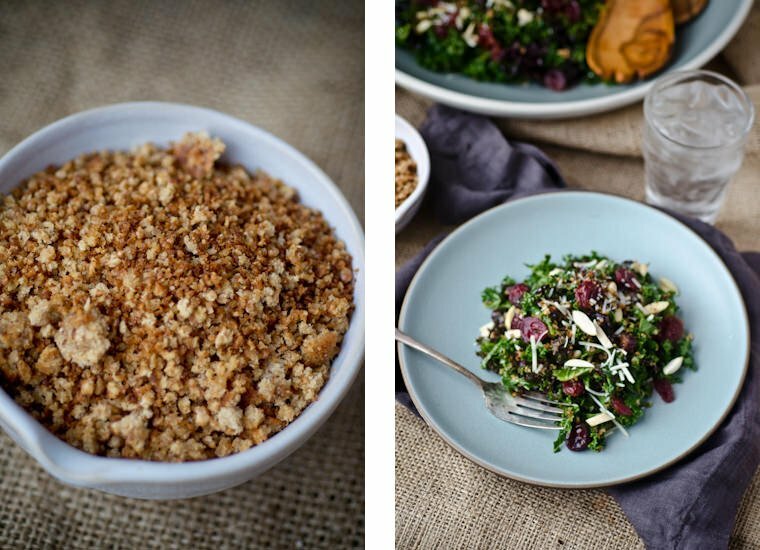 Garnish the salad with the remaining breadcrumbs when you are ready to serve. Hi! 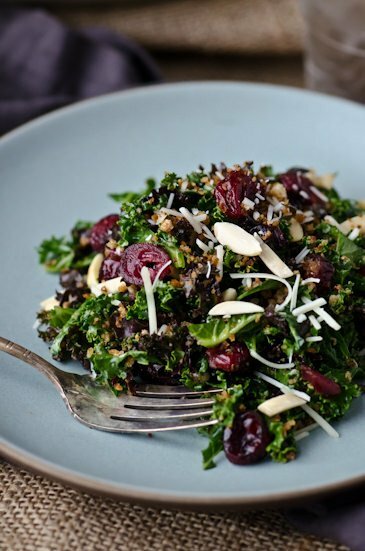 I tried this tonight; trying to figure out how to use up a big bunch of kale. I have the non-curly kind, and had to change it a bit, since I don’t have all the ingredients – I defrosted some berries instead of the dried cranberries, used un-toasted almonds, and had to go without the parmesan cheese. It was delicious! Perfect mix of flavours and textures – sweet, tangy, bitter, crunchy, soft and chewy. Thanks for such a great recipe!